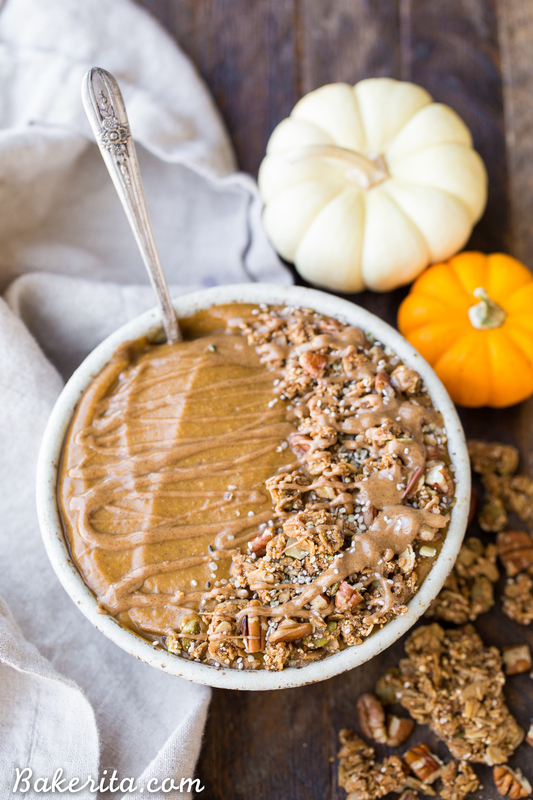 This Pumpkin Pie Smoothie Bowl tastes like a smoothie version of pumpkin pie filling! It’s loaded with veggies for a filling, nutrient-dense breakfast that’s bursting with fall flavors and spices. It’s gluten-free, paleo, vegan and Whole30. I know it’s fall and all, but it still feels like July! And with this heat, I’m still craving cool treats, like smoothie bowls, to help keep me cool, instead of the oatmeal and hot chocolate I’d be wanting if it actually felt like fall. I’m waiting for those days…especially since I was just in Lake Tahoe for the weekend, and saw the most beautiful array of color changing leaves, all shades of red and gold, and I’m really missing the chilly bite in the air. But for now, since I’m back in sweltering San Diego, I’ll keep doing my smoothie bowl thing. Since it is fall though, I’ve got to incorporate some of my favorite fall flavors into my smoothie bowls too, instead of my usual acai bowl or berry pitaya smoothie bowl. 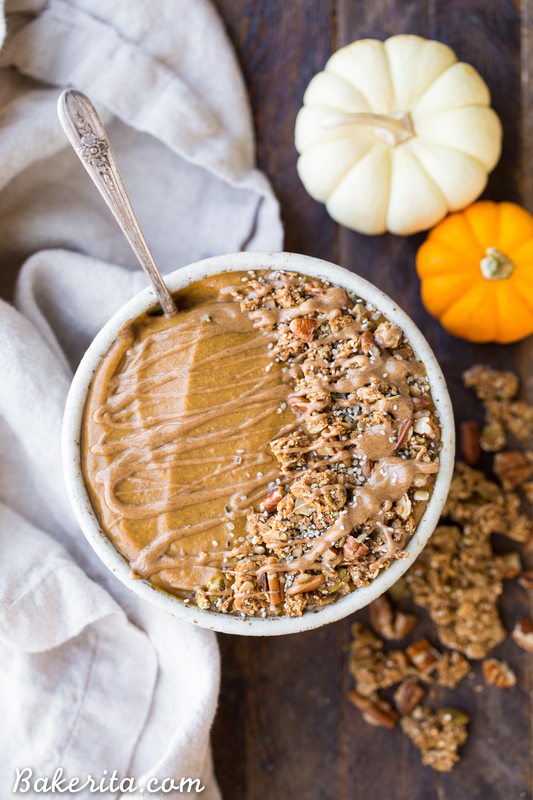 This Pumpkin Pie Smoothie Bowl is everything you love about autumn flavors, packed into a refreshingly delicious breakfast. Banana is the only fruit invited to the party – it helps make the pumpkin pie smoothie super creamy and it adds a little bit of sweetness as well. Pre-steamed and frozen cauliflower also helps add some creaminess to the smoothie, and it does not taste like cauliflower in your smoothie – promise! 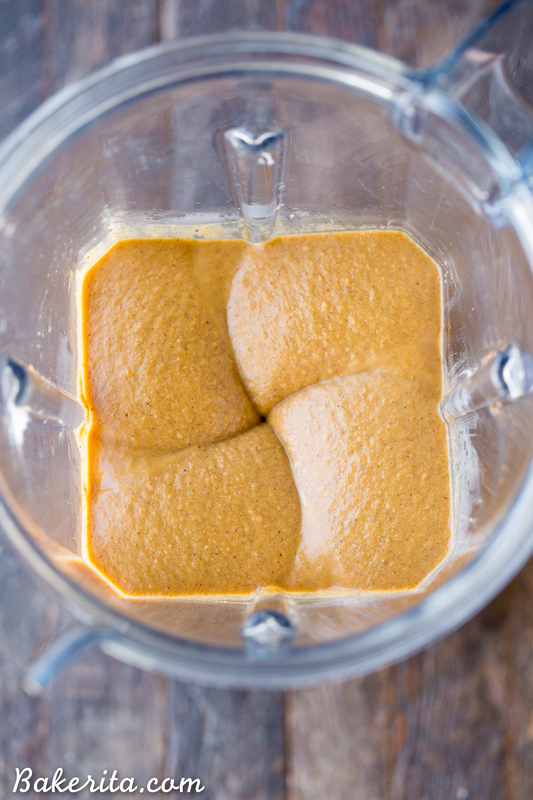 Of course, it wouldn’t be a pumpkin pie smoothie without pumpkin puree in there. There’s also some steamed + frozen butternut squash. Like the cauliflower, the squash is undetectable. Because the flavor is so similar to the pumpkin, it just adds a bit of extra complexity and sweetness, while also adding a bunch of vitamins (especially vitamin A!) and nutrients to the smoothie bowl. I also added a date to help sweeten things up a bit – you could add 2 if you prefer things a bit sweeter, or skip the sweetener altogether if you don’t have a big sweet tooth! Pumpkin pie spice, a mix of cinnamon, nutmeg, cloves, and ginger, is added to the mix as well, to add those warm fall flavors. I like adding a tablespoon of almond butter for some extra protein and creaminess, and then just blend away with some dairy-free milk! The resulting smoothie bowl tastes like frozen pumpkin pie filling – it’s smooth, creamy, and full of warming spices. I also blended this whole thing with my new Explorian E310, a new lower priced blender from Vitamix. I love this little guy – it’s shorter and smaller than my old Vitamix, and can fit under my counter all stacked, which is a BIG plus. Despite its smaller stature, it still has ALL the power I’ve come to expect from a Vitamix. It made easy work of this smoothie bowl. I topped mine with some pumpkin granola, flaked coconut, chia seeds, and almond butter, and it was like pumpkin pie in a bowl. 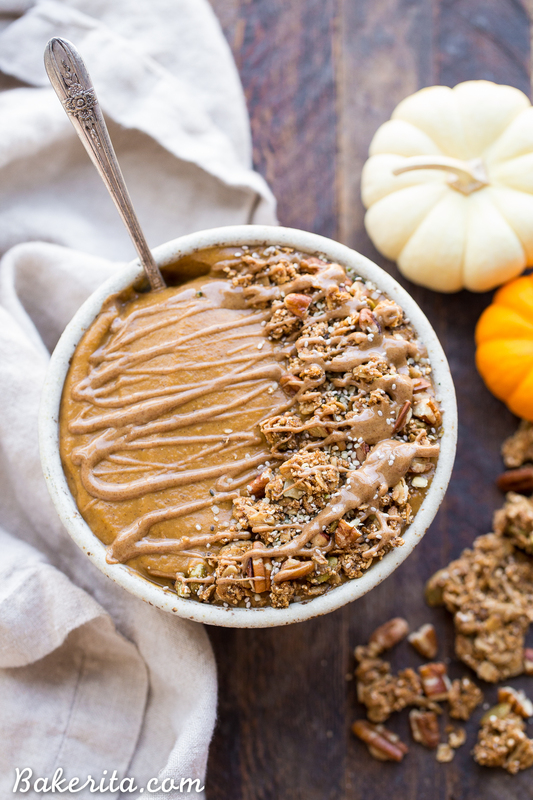 If you’re still dealing with hot weather, you’ve got to try this pumpkin pie smoothie bowl to get your pumpkin fix! Or, if you’ve already got the heat jacked up, you can let it cool you down a bit ;) if you’re a pumpkin pie lover, this recipe is a must try. Enjoy! 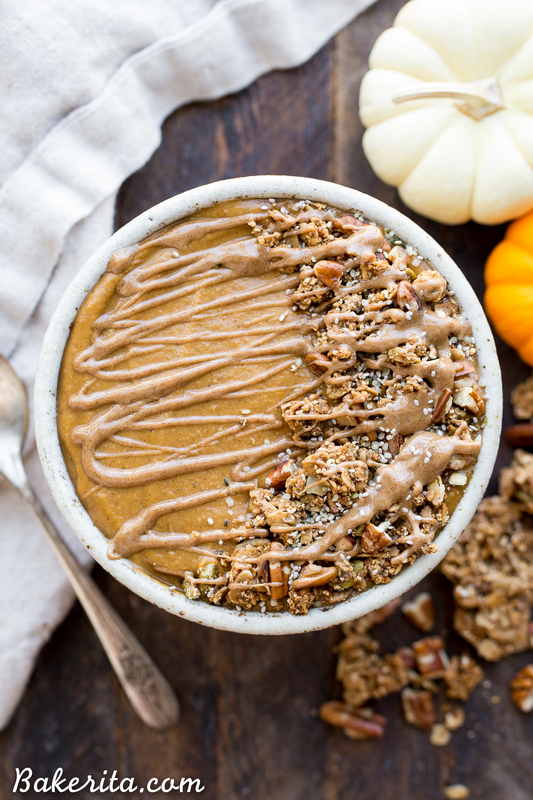 This Pumpkin Pie Smoothie Bowl tastes like a smoothie version of pumpkin pie filling! It's loaded with veggies for a filling, nutrient-dense breakfast that's bursting with fall flavors and spices. It's gluten-free, paleo + vegan. Combine pumpkin puree, butternut squash, banana, cauliflower, date, pumpkin spice, almond butter, and liquid of choice in a blender (I used my Vitamix). Puree until completely smooth - the mixture should be thick. Add a touch more liquid if necessary to get it to blend completely smooth. Nutritional facts do not include any toppings. Thanks to Vitamix for providing me with a Vitamix Explorian E310 for this post. OMG! That looks like heaven in a bowl Rachel! :) I am literally going to buy and steam and freeze cauliflower, just so I can make this. For anyone else’s recipe I’d just leave it out – but when you say to use something, I listen because your recipes are always amazing! :) It’s only 41 degrees where I am, totally fall weather FINALLY and anything pumpkin has been calling my name since September 1st :) Can’t wait to give this one a try! Thanks so much for your kind words SK!! I can’t wait for you to try this :) I hope you love it! Enjoy. ‘Did you figure out the nutritional values? I am wondering the same.. The post has been updated to include nutritional facts!